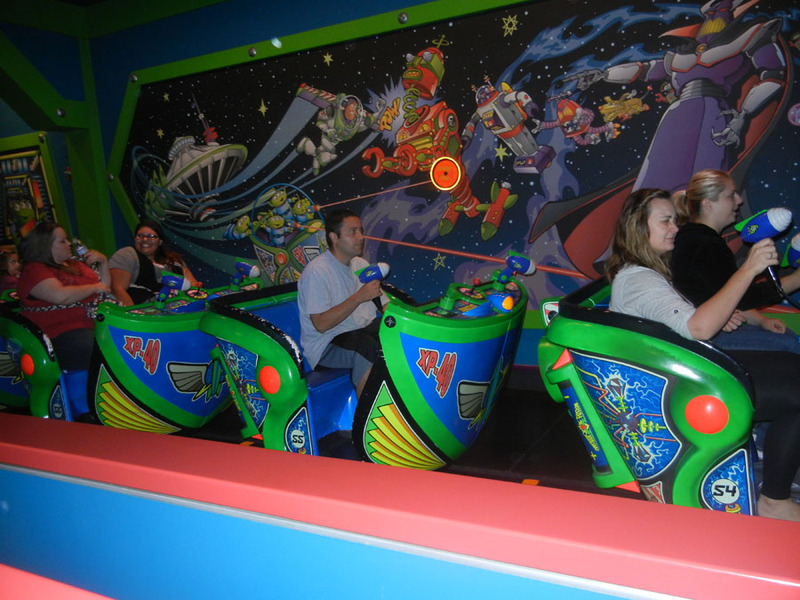 Buzz Lightyear's Astro Blasters is a dark ride where guests use a light gun to shoot at targets while they ride in a spinning cart. 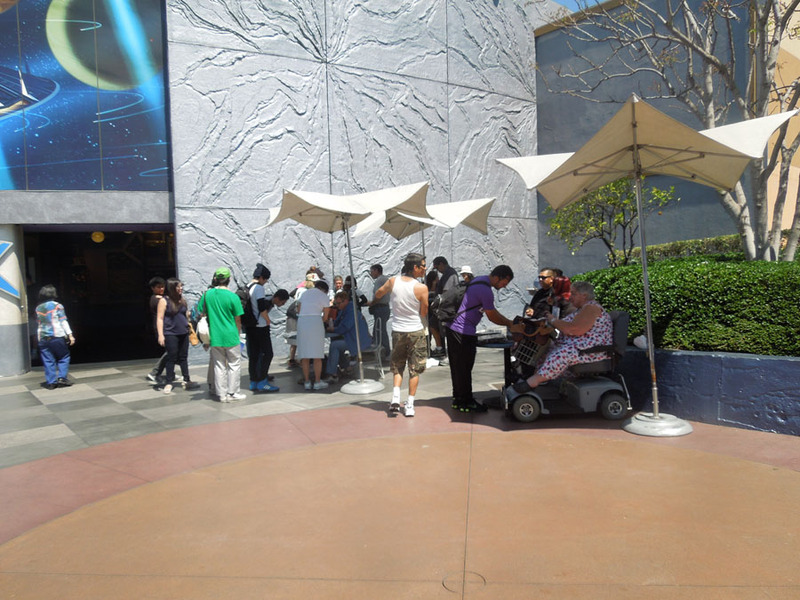 There isn't much room for a line inside the building, so there is often a crowd in the chains here near the entrance of Tomorrowland. 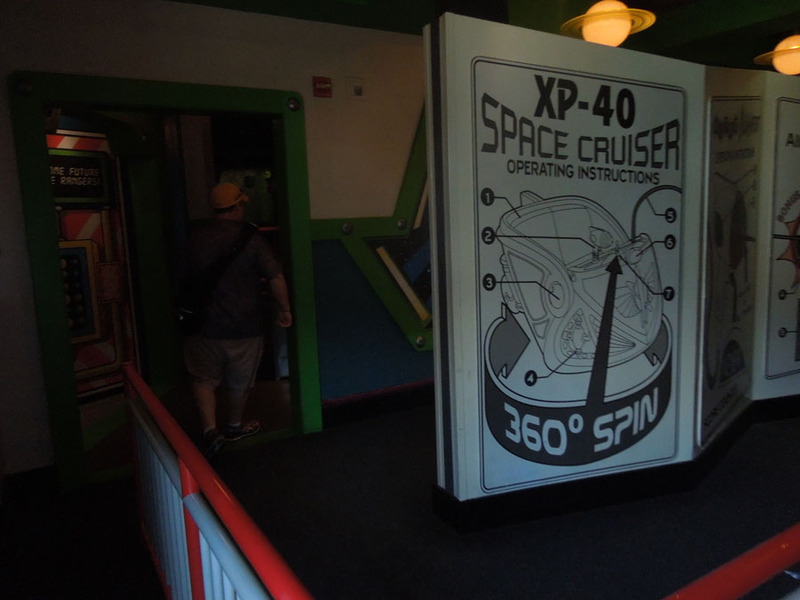 Seems to have been inspired by Disney Pixar's Toy Story 2. 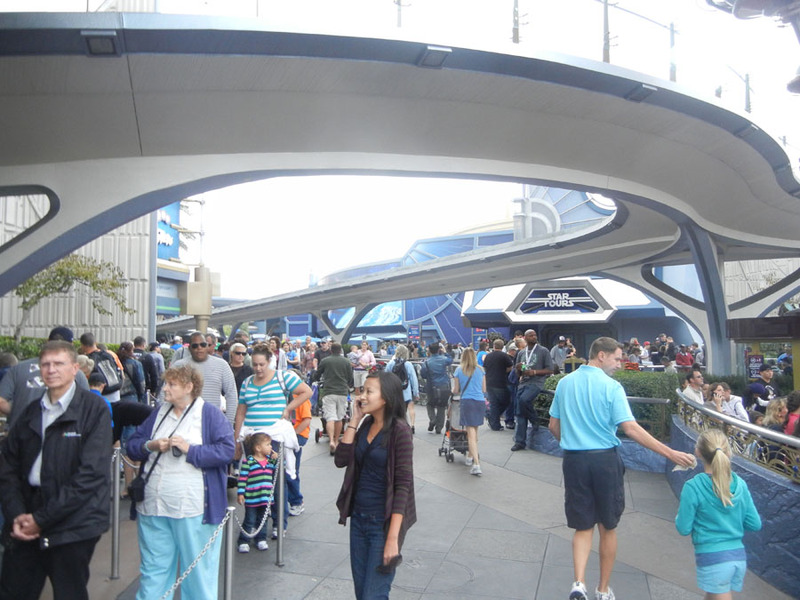 One of these doorways is the entrance to Astro Blasters. 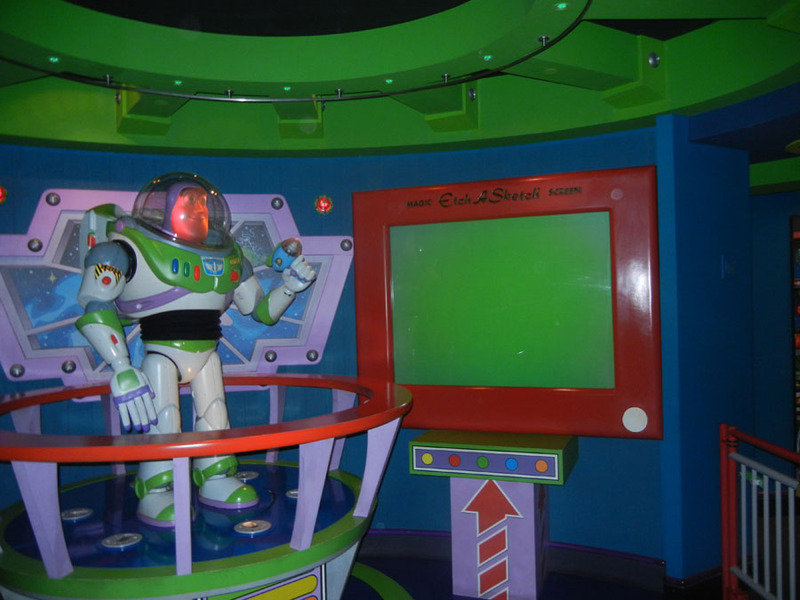 Inside you meet Buzz Lightyear, who walks you through the adventure you are about to embark upon. 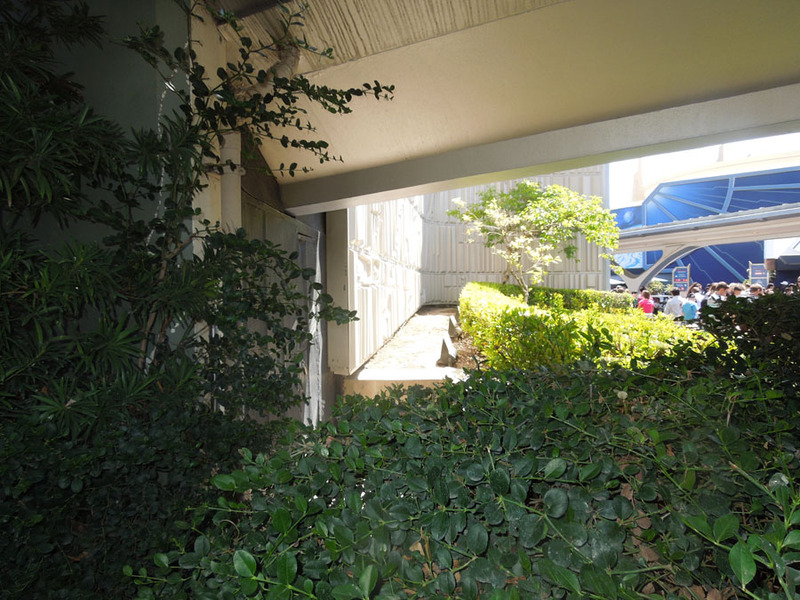 More entertaining info to view when you are in line inside the building. 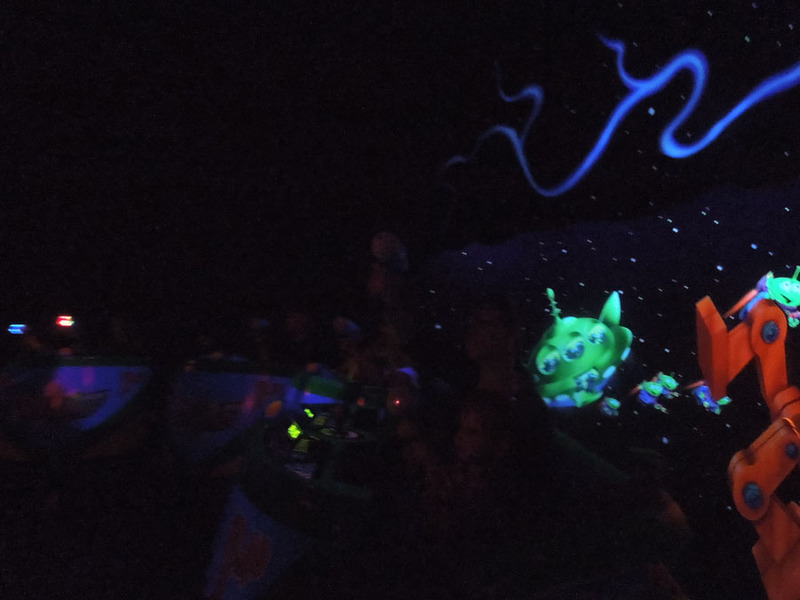 On the ride, it is very dark, most of the displays are in blacklight. 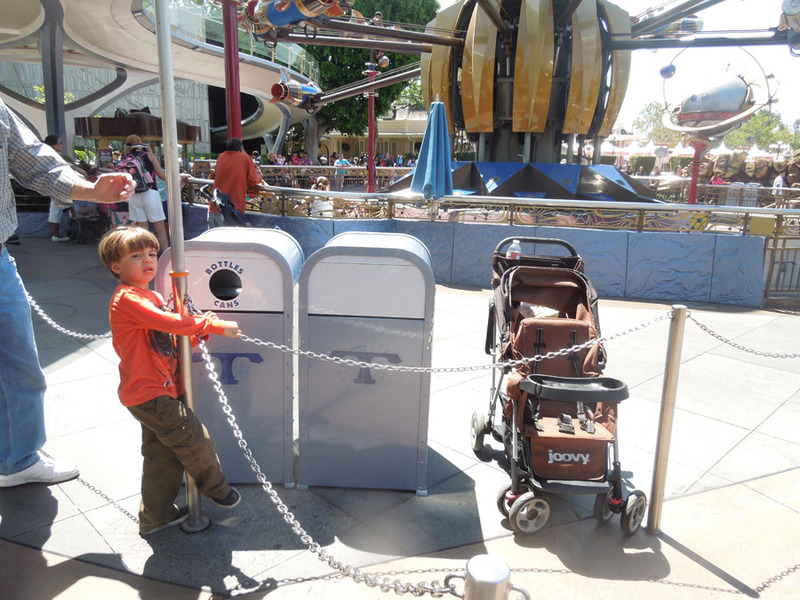 The carts are drawn in like the doombuggies in Haunted Mansion. 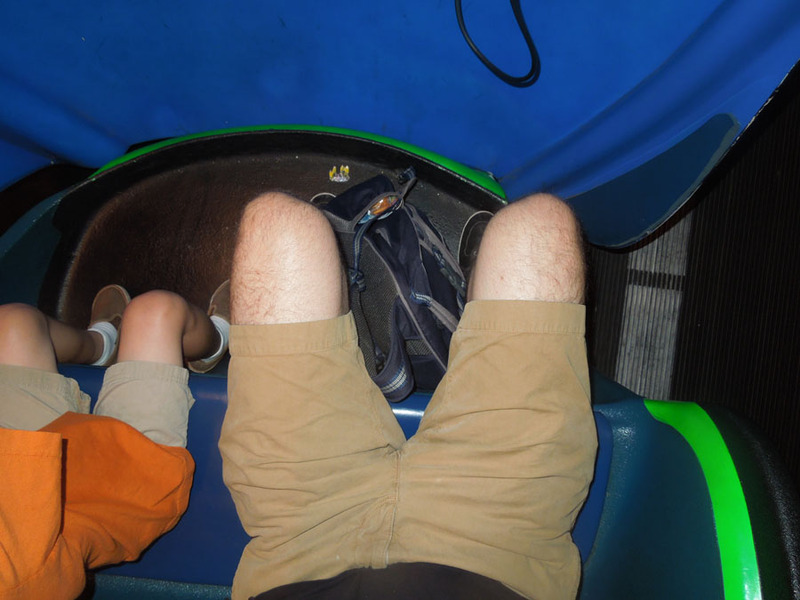 Plenty of room for backpacks on the ride. 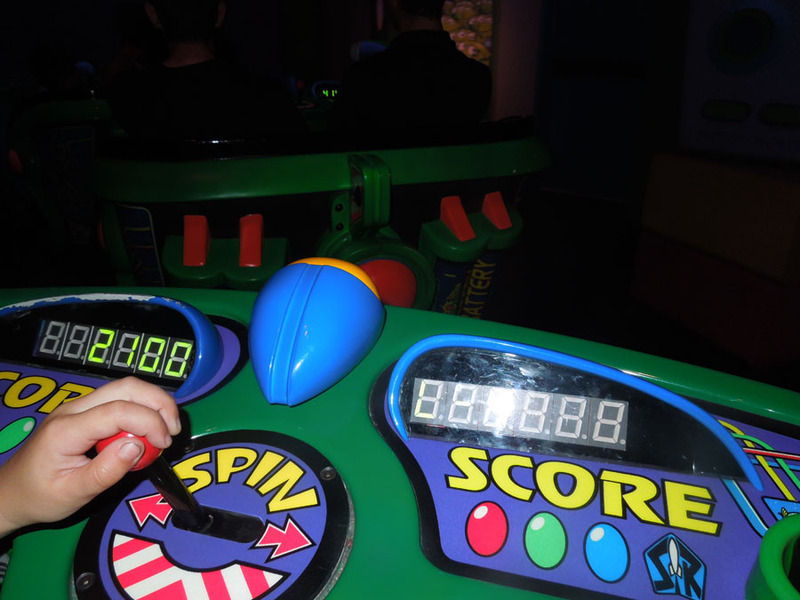 The Scoreboard is on the dashboard. 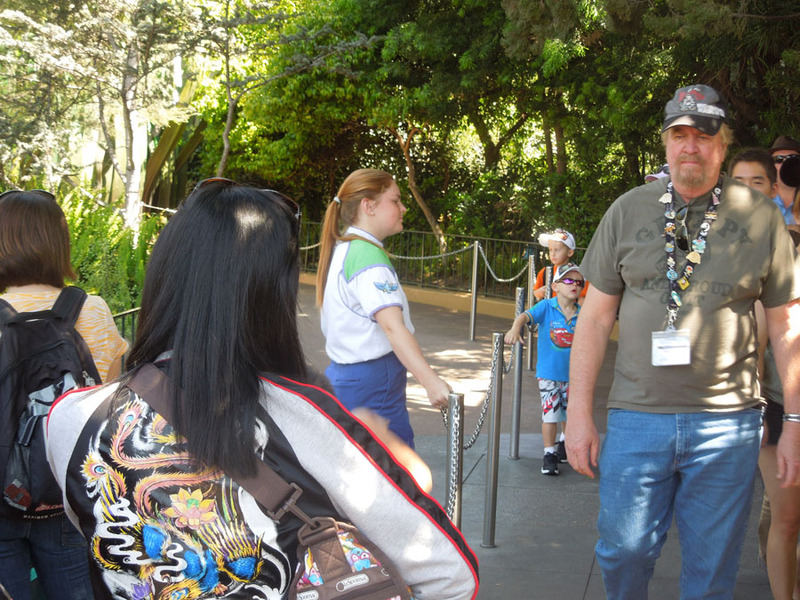 Guests departing. 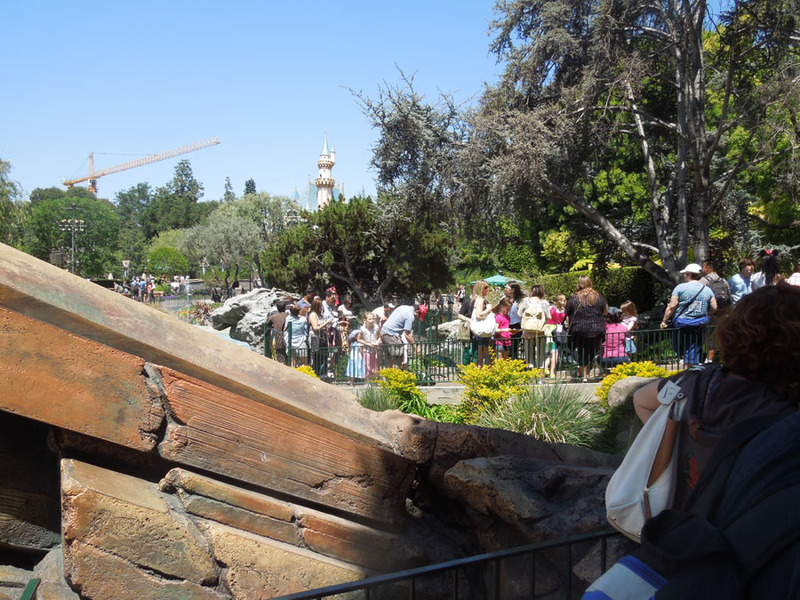 Disneyland is pretty good at showing the people in line what the boarding procedure looks like. 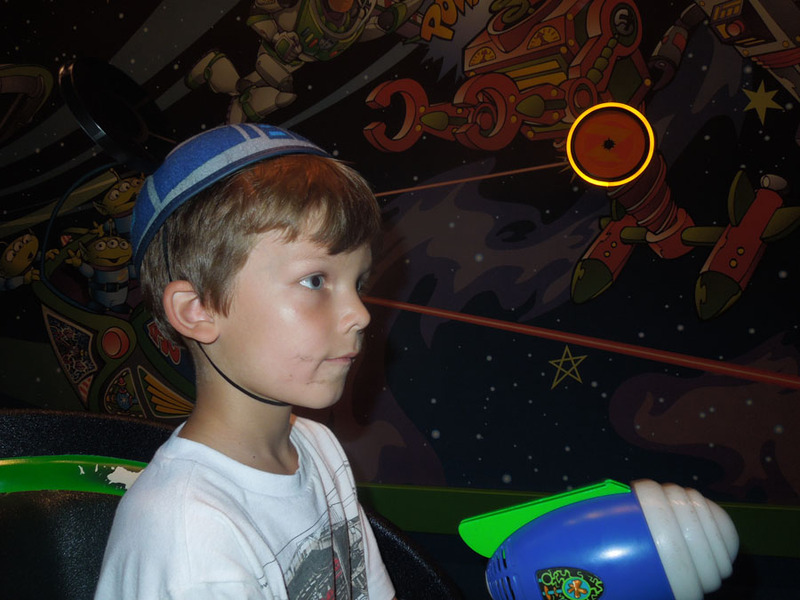 The lit circle above is a target. 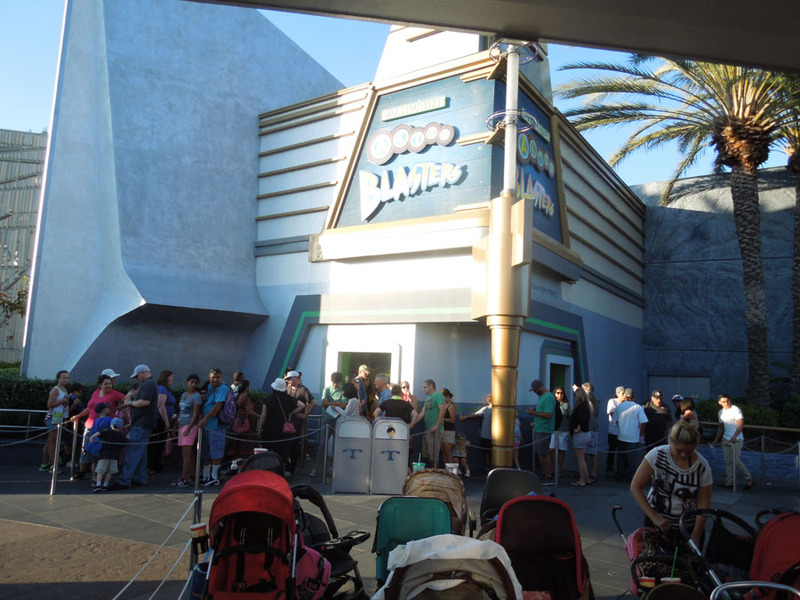 The line for Buzz Lightyear. 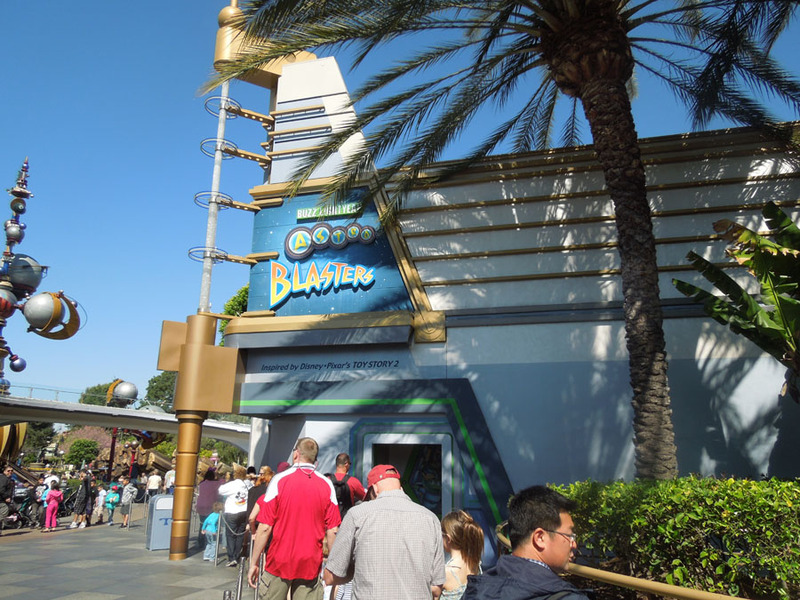 Astro Blasters exits through a gift shop. 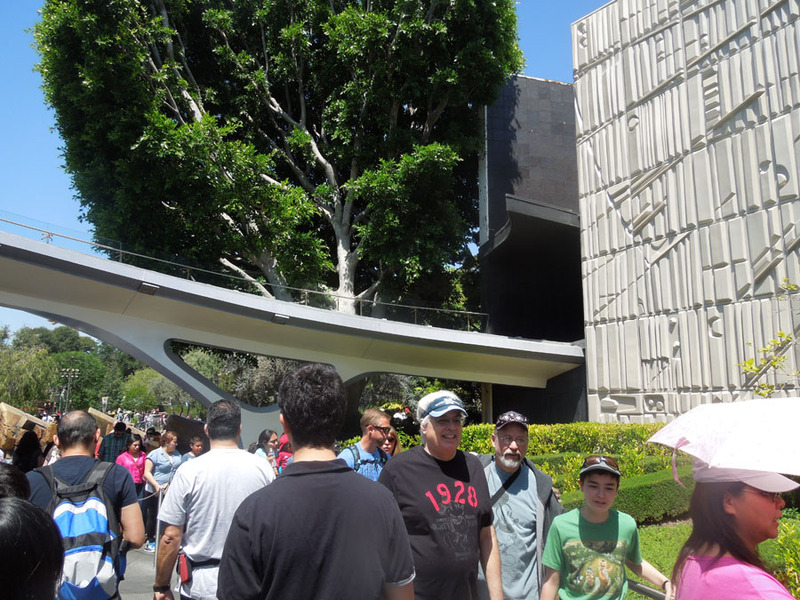 That gift shop exits here, a bit east from the entrance. 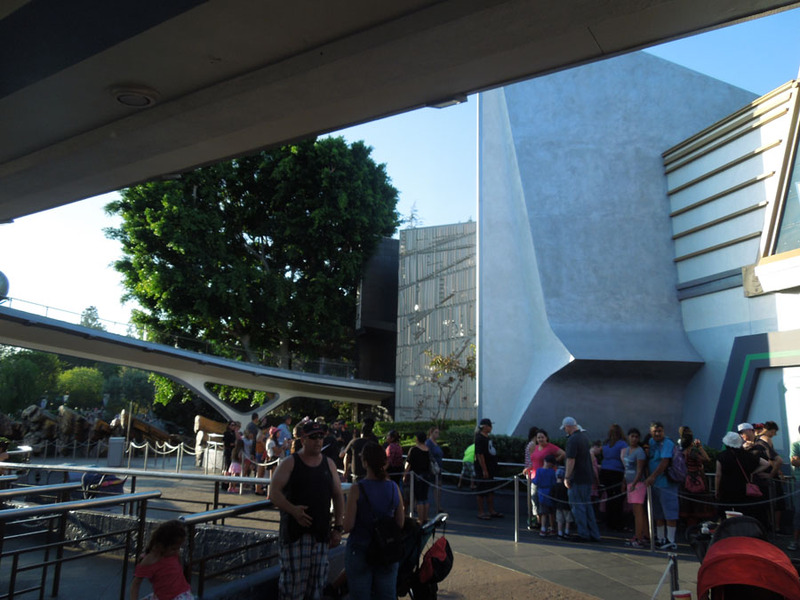 People mover track above the Buzz lightyear line. 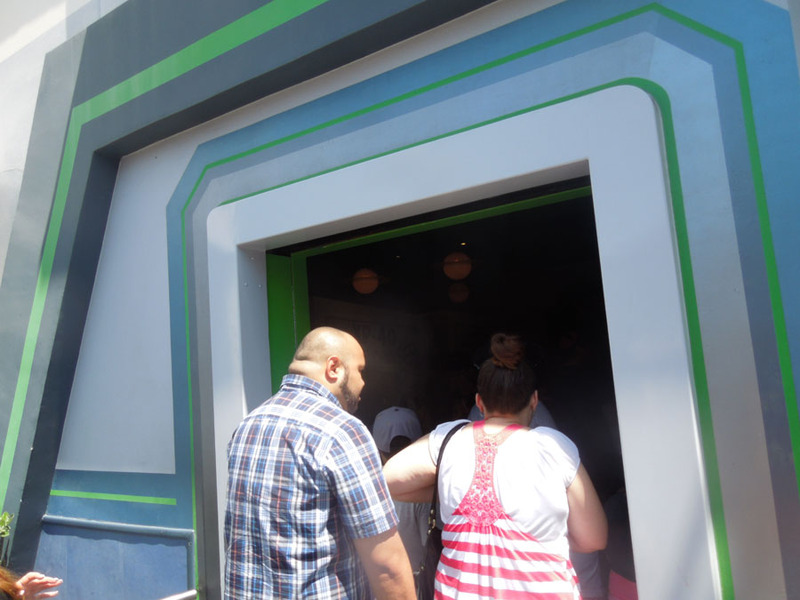 Viewing the line for Pixie Hollow from the Buzz Lightyear line. 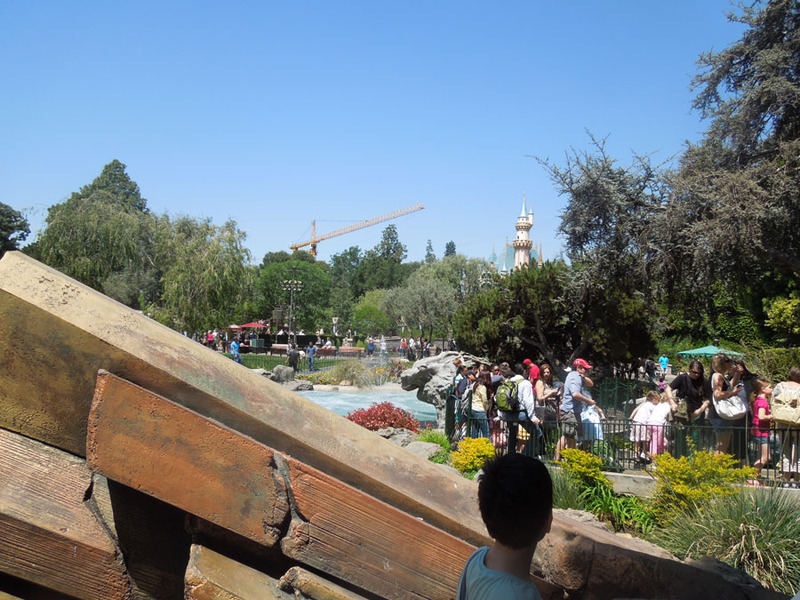 Looking back to towards the castle. 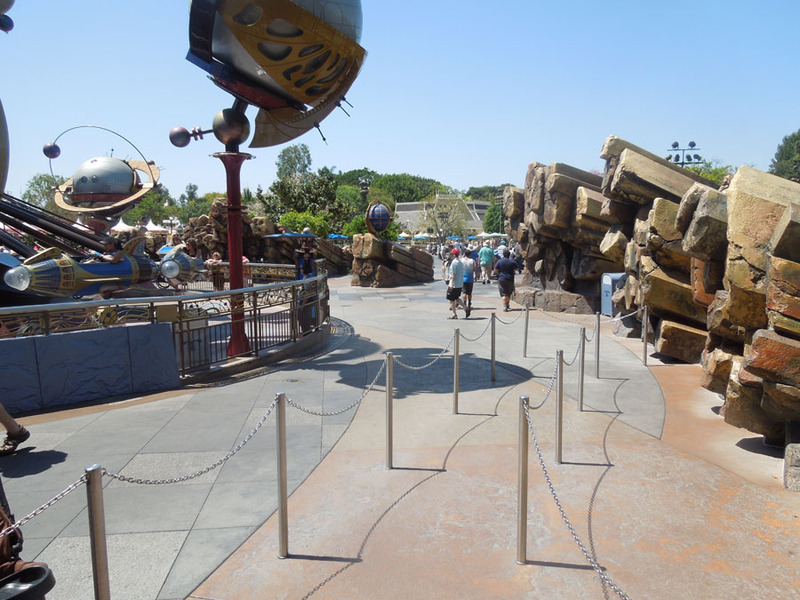 Line chains for Buzz Lightyear. 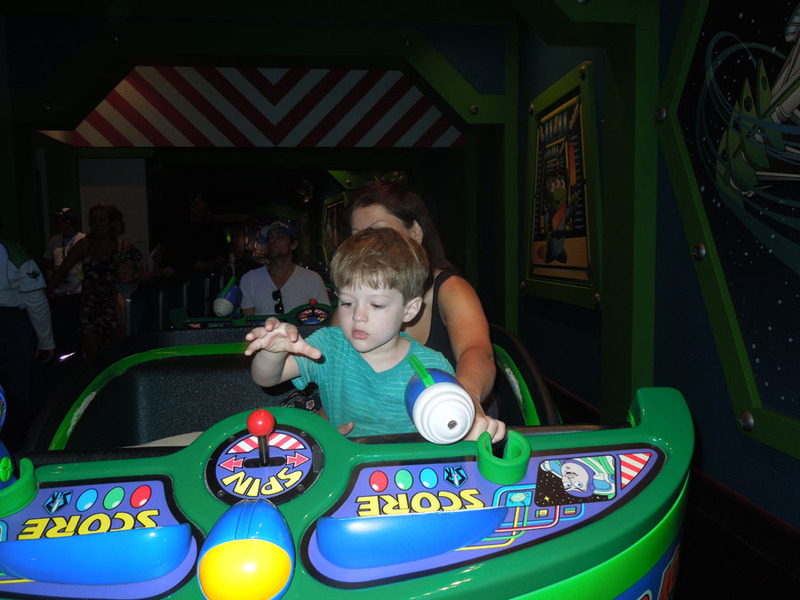 Astro Orbiter from Astro Blasters line. 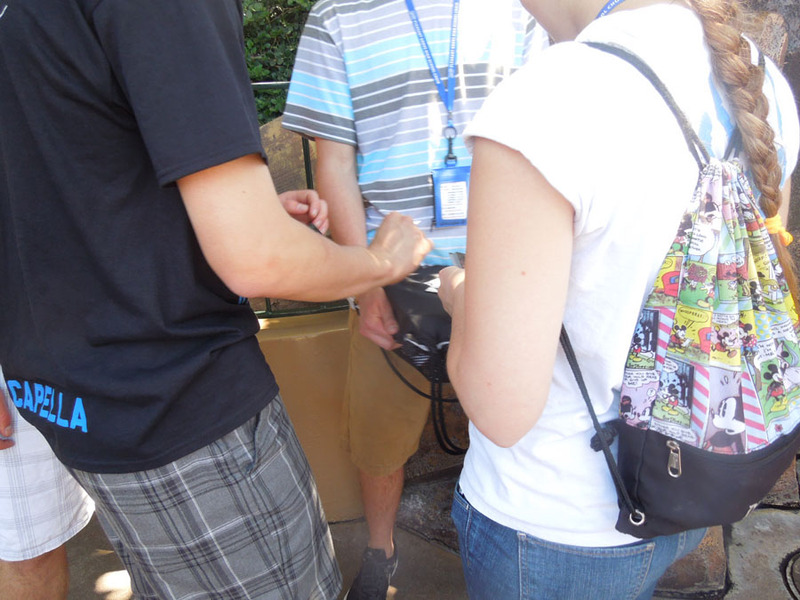 These kids were playing cards on an improvised backpack/card table. 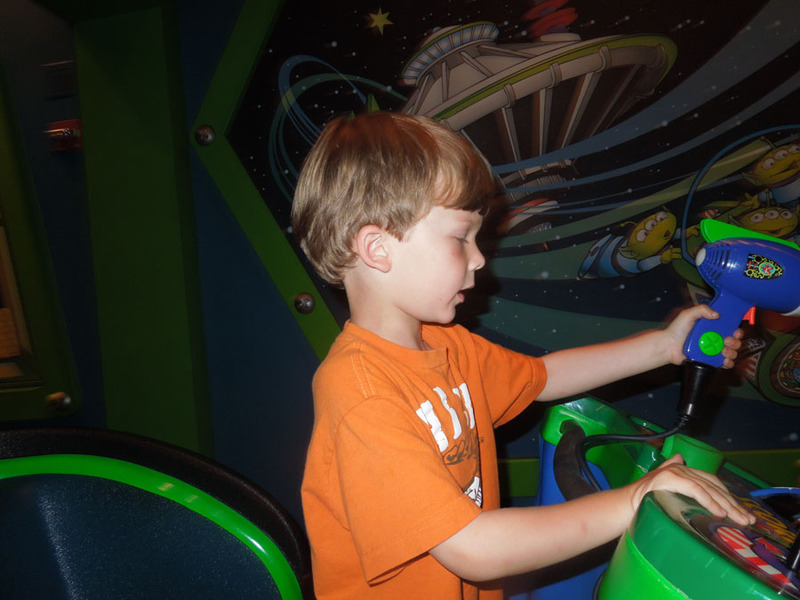 Cast member shortening the chain route for Astro Blasters. 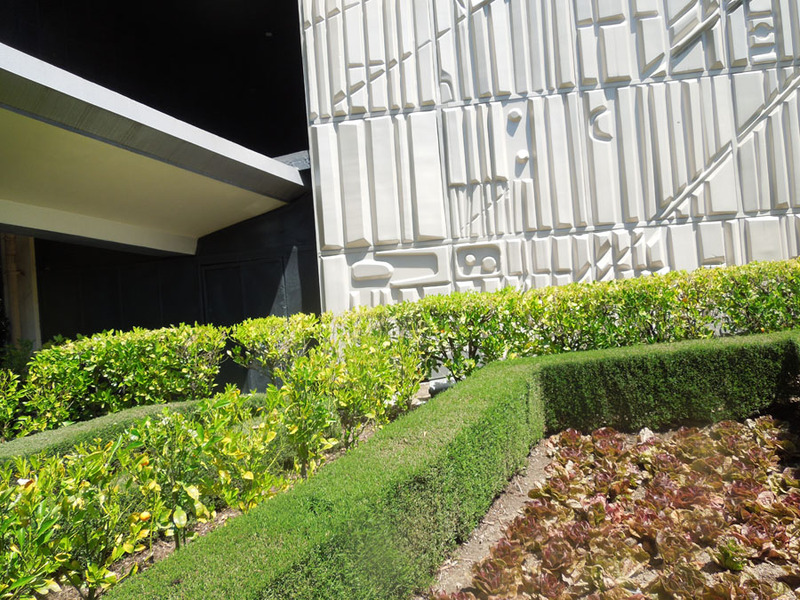 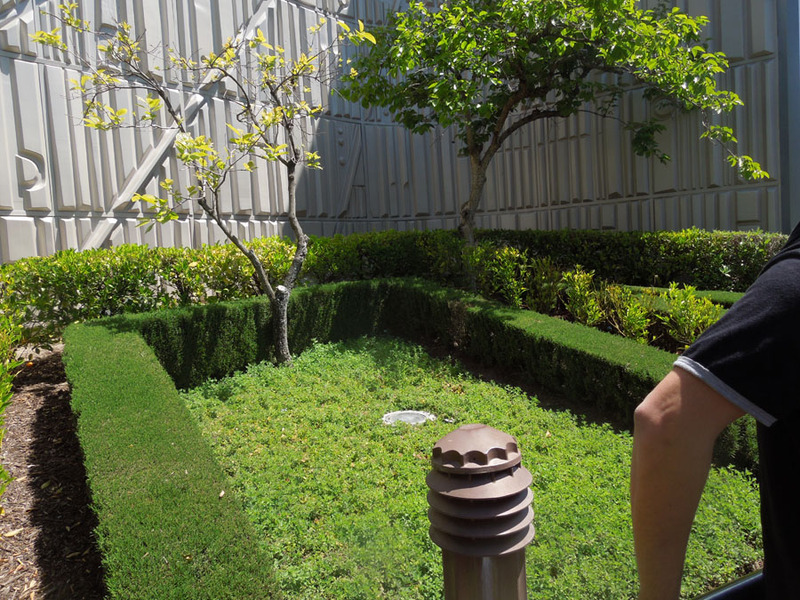 Hedges and plants in Tomorrowland. 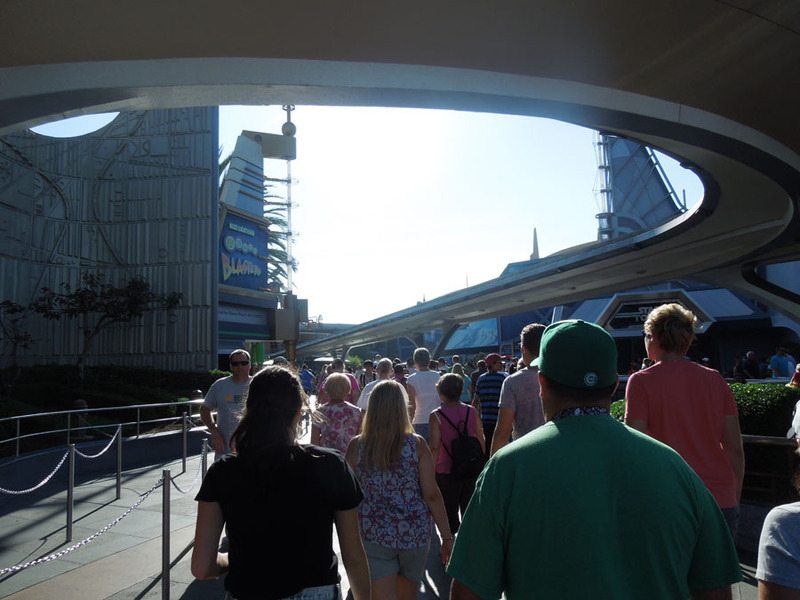 The tracks for the old Peoplemover ride still dominate the view overhead in Tomorrowland.